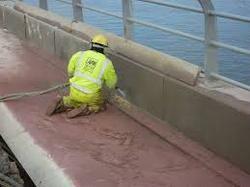 Wet Abrasive blasting provides with a dust free blasting process and it also has low noise. For the application of any protectivan essential, . In this process the metal surface is thoroughly cleaned and roughened using compressed air with suitable abrasives like Grit, Sand, Quartz, Aluminum Oxide etc. The abrasives are propelled using compressed air on to the substrate to removecale, Oil, Grease, Dirt, Rust, Oxides or paint to create a profile for any protective coating. 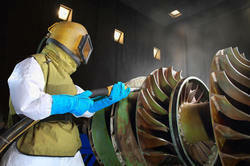 We are engaged in offering Abrasive Shot Blasting Services. We provide our services as per client requirements at affordable prices. Be it on site, where need is for maneuverability or in fixed environment like blast rooms, these are tried and tested throughout the nation. We are involved in rendering Abrasive blasting services to our most valued customers. Our services are extremely applauded in the market due to timely completion and consistency. These services are rendered employing the advanced techniques. Owing to high demand, we render our services at nominal costs. By using advance technology, we are involved in providing Abrasive Blasting Service. Leveraging over the skills of our qualified team of professionals, we are instrumental in offering wide range of Steel Abrasive Blasting. We are offering Abrasive Blasting Service to our clients. We have inhouse blasting booths and panting booths for the toatal surface solution of your product and equipment. Abrasive Blasting involves removing outside film from a part by using abrasive directed at high speed against the part. Abrasive blasting includes bead, grit, shot, and sand blasting, and may be performed also dry with water. We are listed amongst the top firms in the market engaged in offering a large collection of Shotcreting Abrasive Blasting Service to the clients. These services are cost effective, attractive results and executed according to the patron's requirements.